I’ll start by saying that, for those of you who are only here for the nutrition and fitness tips, this is a post you can likely skip. It’s not that I was unhealthy (I talk a bit about it in #4), it’s just that this is more of a personal recap of the trip, for my own memories, as well as for our family and friends (both “real life” and “blends”!). If you’re curious about our trip, though, I hope you read on! 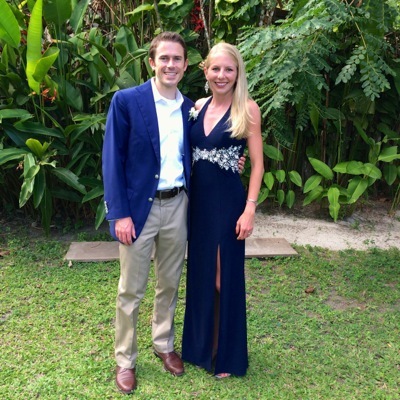 As many of you know, Kevin and I had the amazing opportunity to travel to Brazil last week. When our good friend Peter (Kevin’s roommate for three years in college) announced that he would be getting married in Brazil, Kevin and I decided to make a full vacation out of it, and head to Rio de Janeiro by ourselves for three days before heading to Trancoso, where the wedding took place. We made more amazing memories and had more incredible experiences than I could possibly talk about in one post (and if you’ve seen our honeymoon blog or our Asia and Australia adventures blog, you know I can be quite wordy about our vacations! ), so I’m only going to hit the highlights here. I’m more than happy to answer any questions you have in the comments! 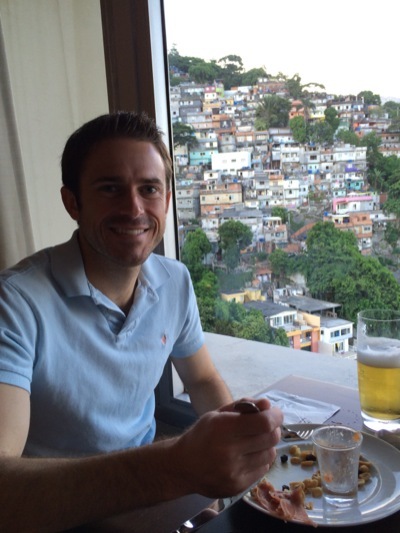 And here is Kevin sitting in a little mini-restaurant/ bar on Copacabana Beach: Rio is famous for its many favelas (which are basically large developments of crowded, underprivileged residences … Wikipedia calls them “shanty towns”). We were quite close to the Vidigal favela, and staring at it from our hotel made us so grateful for many things we take for granted, like the comforts of a safe and modernized home, personal space, and clean running water. Here, we are sitting in our hotel lounge, and you can see a bit of the favela in the background: I also want to touch on two bits of culture, and I really hope I don’t offend anyone. I completely understand that cultures are different, and I just want to share my observations. 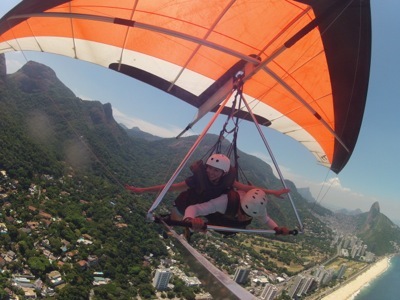 First, as a woman in Brazil, it was incredibly hard to get attention … I could stand at a bar for 10 minutes and the bartenders would serve every man in sight before getting to me, Kevin’s hang gliding guide took him about 90 minutes before I got to go (and even said something like “hey, we’re all about machismo”). Second, people seemed so much more comfortable with their bodies than they do (in general) in the US. Some larger people were wearing Speedos, tiny bikinis, and crop tops, some “skinnier” people were covered up … it’s hard to explain, but both Kevin and I noticed that there was just much less body shame. It was incredibly refreshing and admirable! 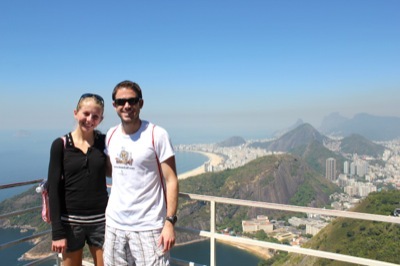 Sightseeing tour: On our first full day in Rio, we took a full-day tour of some of the major tourist highlights. 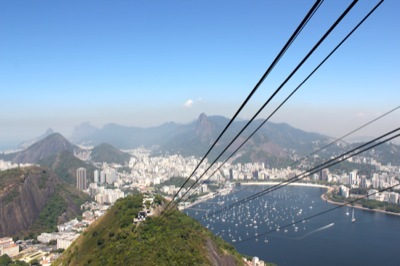 Two of our favorites were a cable car ride up Sugarloaf Mountain, and viewing the Christ the Redeemer statue. 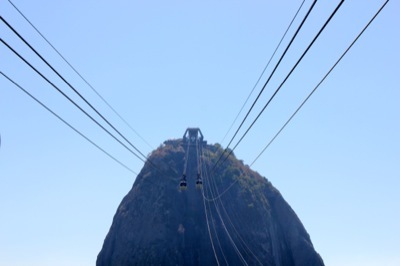 Here is one of two cable cars leading us up to Sugarloaf: The views were incredible, and we enjoyed getting to spend time relaxing and taking it all in at the top of the mountain. Despite some travel glitches (including a fire on the mountain near the train that was supposed to take us to the top), we eventually made it by van to the Christ the Redeemer statue. 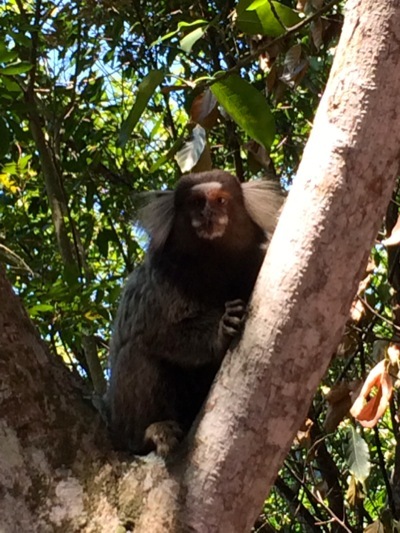 On the short hike up, we saw some adorable marmosets: Seeing the statue was at the top of our list, since it is such a historic and famous site. 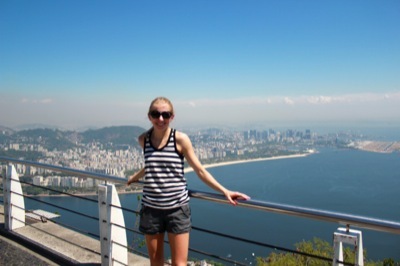 The views were (again) incredible … Rio is such a sprawling and beautiful city, and we could have stayed up there forever just staring! 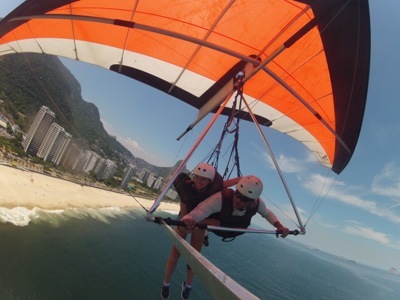 Hang gliding: On our second (and last) full day in Rio, we decided to take the adventure of a lifetime … hang gliding off of a 2,000-foot cliff overlooking the ocean! It was actually Kevin’s idea, although I think he regretted it later because he was far more scared than I was once we made the long drive up to the top! Running and jumping off of the cliff was pretty scary (you have to run fast to gain enough speed for the wind to pick up the glider! ), but once you are up in the air, the views are absolutely incredible. It really did feel like we were flying, and I felt secure the entire time. During my 10-minute ride, I saw beaches, rode over the ocean, flew over some beautiful housing developments, and tried to remember every moment. We even have videos uploaded to YouTube if you want to see more. 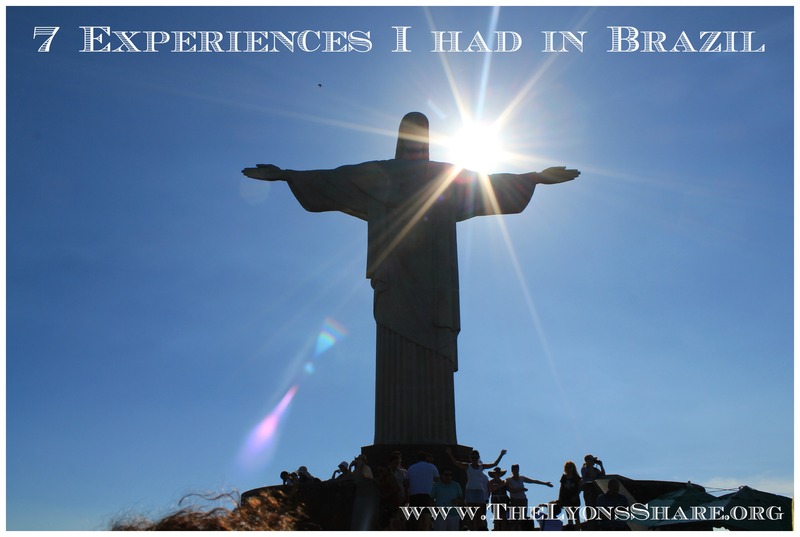 I highly recommend this to anyone visiting Brazil – it was incredible!! (if you can’t see the videos in the post, click here for mine and here for Kevin’s). 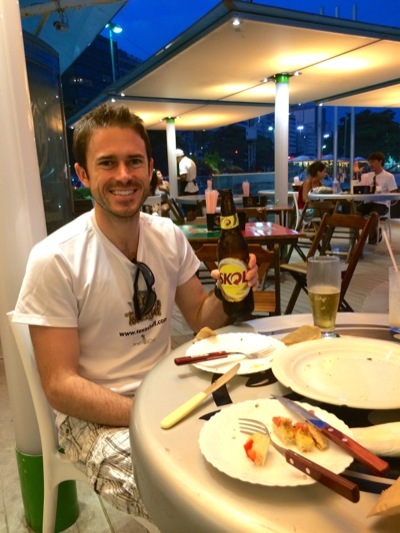 Staying healthy on vacation: For me, the trip to Brazil was a perfect balance between staying healthy and splurging a little bit. I indulged in my fair share of drinks, and didn’t pass up any Brazilian specialties, but also made my best effort to include vegetables at every meal (which wasn’t too difficult) and bring my own stock of healthy snacks. 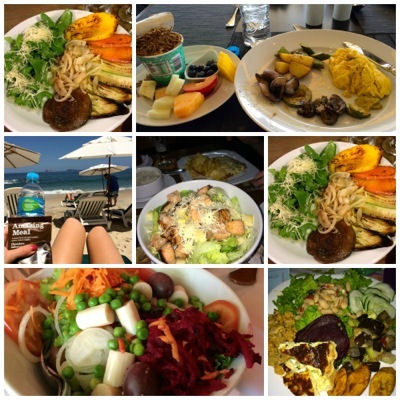 Here are several meals that I enjoyed in Brazil: One of my biggest tips for staying healthy on a vacation is to continue your exercise routine. Of course, you should (in my opinion) give yourself flexibility and grace – don’t beat yourself up for missing one workout! But, in general, getting in daily exercise can make you feel like “your healthy self” and eliminate any of those “off” feelings you can sometimes get from traveling and eating different/ more food than usual. Kevin and I managed to exercise 7 of the 8 days we were gone (including long travel days!) 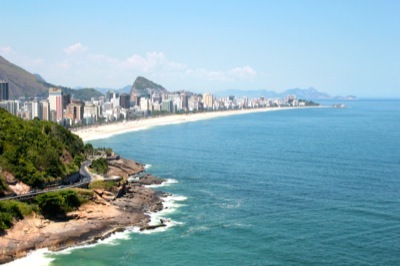 In Rio, there were tons of people running, walking, participating in Bootcamp-style exercise classes, playing volleyball, and so much more – the beaches were an amazingly active place, so we fit right in! 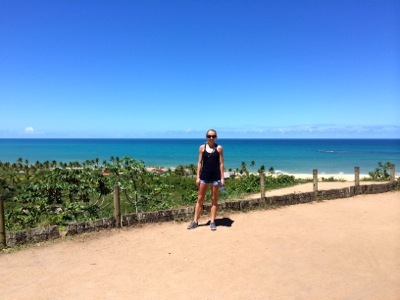 In Trancoso, exercising outside was less frequent, but there was a great, hilly dirt road close to our hotel, and we also ran on the beach frequently. 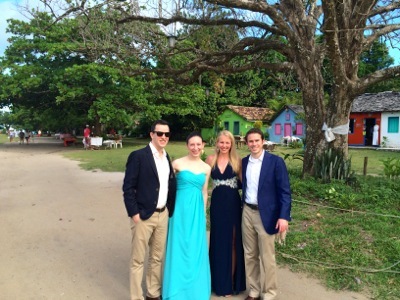 Trancoso and seeing friends: On Thursday, we made the 2-flight journey to Trancoso, where the wedding was held. 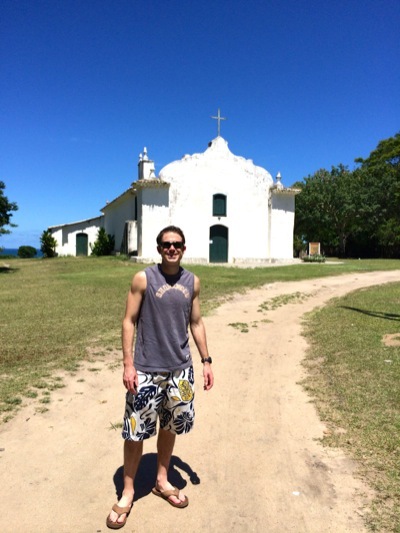 Trancoso was such a contrast to Rio! It felt more like “old-time Brazil,” with only dirt roads, less modernity, and tiny mom-and-pop shops lining the town square. We stayed in an adorable “pousada” (like a bed-and-breakfast), and had our own mini-house with hammocks on the porch! 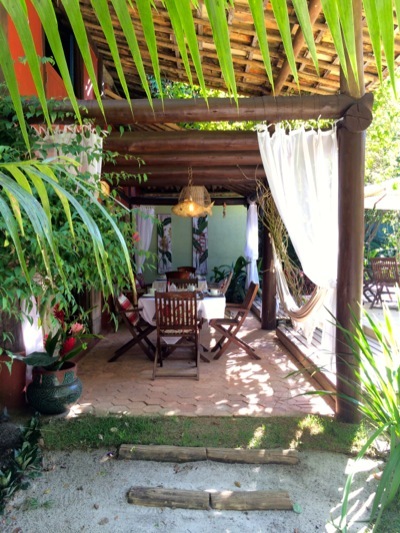 Here is the main seating area, which looked right over the pool: On our first full day in Trancoso, Kevin and I walked around and explored as much as possible. 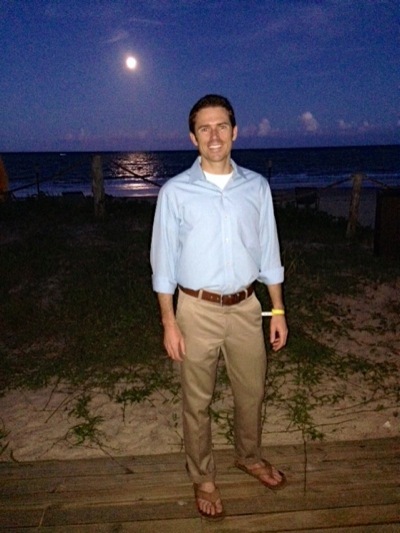 Here he is in front of the church where the wedding took place, and I am in the town square overlooking the beach: One of the best parts of the trip was getting to see some of our college friends, who now live all over the country (and world). It was amazing to catch up with them, and I wish we all lived closer! The wedding events: The night before the wedding, we had cocktails and appetizers overlooking the beach, with a beautiful bonfire. On the day of the wedding, the ceremony took place in the beautiful church pictured above, and the photos after were incredible! I don’t want to share too many of mine out of respect for the couple, but here are a few. The second is all the “girls of the wedding” lined up on steps outside the church. (It is a Brazilian custom for any groomsman who is married to walk down the aisle with his wife, so I was kind of included in the “wedding party” for photos, etc.). 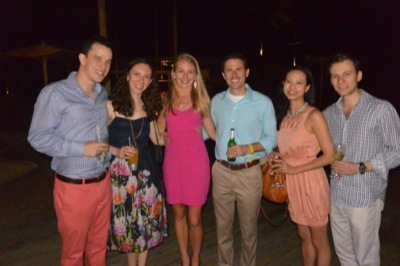 The reception was one of the most gorgeous wedding receptions I have ever seen. The wedding hosted about 450 people, and the reception hall was decorated with the most beautiful and intricate touches. 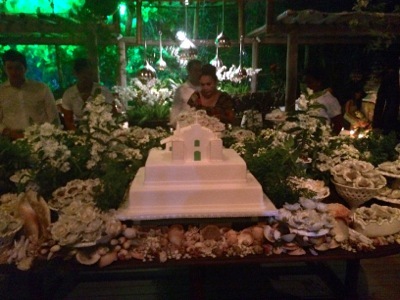 They had a famous Brazilian singer performing, delicious food, great music and dancing, and photographers from Vogue capturing the event since the bride’s dress was made by a famous designed in Paris! Here is the cake table … all of the “flowers” surrounding the cake are actually hand-made chocolates, with the name of the bride and groom carved into them! Incredible! All in all, it was an amazing and unforgettable trip. I am so grateful that we got to experience Brazil, have some relaxing time as a couple, catch up with wonderful friends, and be part of a beautiful wedding of a lovely couple. Perfect in every way! One of my favorite activities as a child was to build a “fort” (basically a sheet hung over some furniture), crawl in with as many books as I could find plus some fruit punch and Chex Mix, and read for hours on end. I loved the solitude and the escape! This still sounds pretty awesome, except maybe I’d go for water and veggies and hummus ;). So tell me in the comments … Have you ever been to Brazil? Do you enjoy reading? What’s the best book you’ve read lately? What a great post Megan. 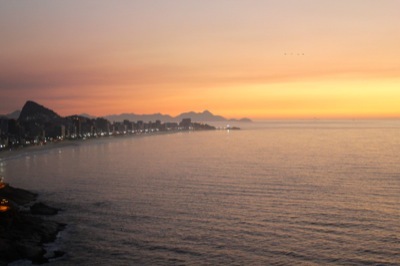 I was in Rio many years ago and fell in love with the city. Rio was a city that just said party. 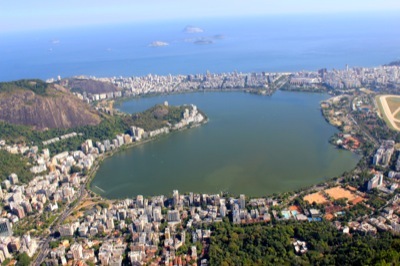 From the food, to Ipanema beach, to the people and the street fairs-I never felt afraid although I didn’t go off the beaten path looking for trouble either. Lucky you being able to travel to a city like Tinosco. Incredible pictures…..Geography lessons don’t cover a city like that-was the bride from there? What a dress she had……..and by the way, Mrs. Lyons, you look absolutely stunning in your pink dress as well as your long black gown……I am your aunt so I can say that!!!! 🙂 Thanks for sharing and Happy Birthday coming up! Thank you, Aunt Debbie! 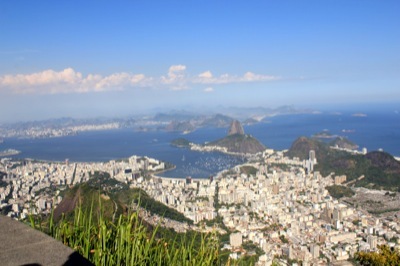 I didn’t know that you went to Rio as well – so glad you liked it like we did! 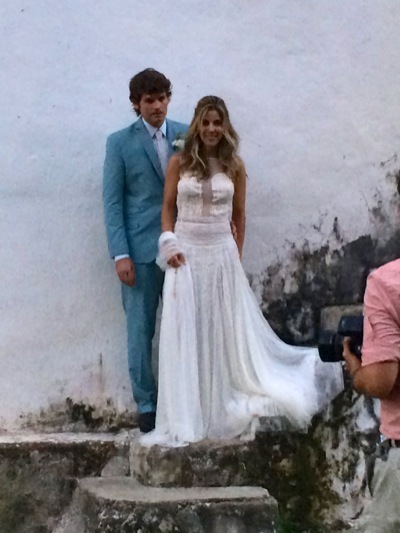 The bride was from Brazil – not Trancoso, but she chose that as a destination because she liked it (and so did we!). And thank you for the compliments – I’m blushing :). Lisa @ Running out of Wine recently posted…Raleigh Marathon Training Week 9 and Freedom! Thank you so much for reading, Lisa! Amanda @ .running with spoons. recently posted…. link love 2/23 . I really hope you make it to Brazil, too, Amanda – and you must go hang gliding when you make it there! First off, you are so gorgeous!!!! The sun did you good 🙂 Not that you’re not always beautiful! Second, SO COOL you went Hang Gliding. Always been a dream of mine! Looks like you had a fabulous time! Aww, thank you Davida! I appreciate it :). 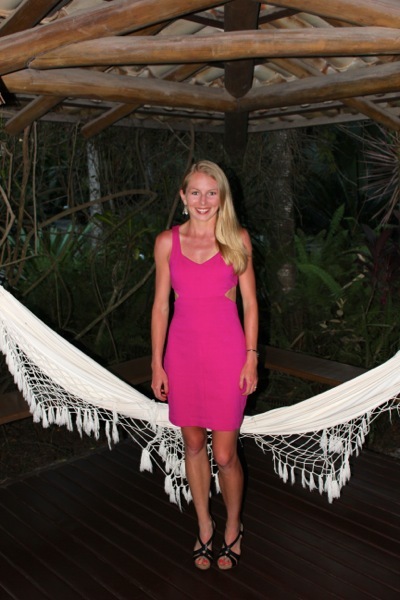 I was actually a little burned (oops – I am usually so cautious, but the sun was extra strong!). 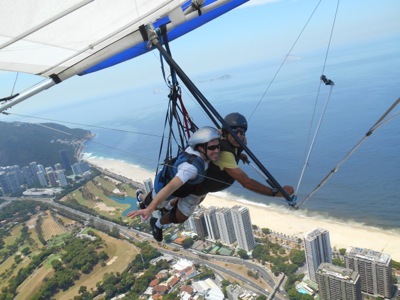 I hope you go hang gliding sometime – it is the experience of a lifetime for sure, so keep it on your bucket list! I remember the library reading contest story being told at your wedding and I still chuckle when I hear it again….and because I think of Kevin going, “shhhhhhhhhhh” every time I say the phrase, “chapter books.” LOVE YOU! I am reading a book about an American girl being kidnapped on vacation and trafficked for 5+ years. I have read quite a few books about the topic and it has become a cause I have started to support, especially after seeing so many very young girls involved in the industry over in Asia throughout my travels. Very scary and very sad. Looks like a great trip! Thanks for the pictures and stories. Wow Megan what a beautiful trip this looks like! I would love to try hang gliding and even though I am afraid of heights this looks like one thing that would be worth it! 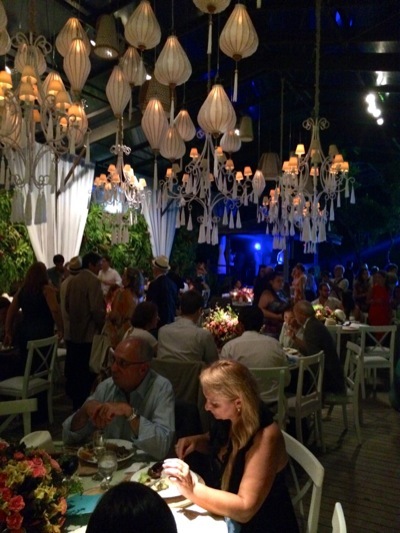 Glad you all had a great time – the food looks GREAT! Sara, if you could get up the courage to run off of the platform, it would be so worth it! It’s not scary once you’re up there!!! Thanks for reading! Megan, what a great trip recap! Felt like i was there. So crazy how women aren’t treated equally. I noticed some of the same thing visiting Costa Rica and Ecuador as well. Maybe not as bad, but def. some machismo stuff. Ps: Looking forward to reading your Asia & Australia blog!!! Just read a few posts and it’s great! Thanks for reading, Angela! I know, we were surprised as well about the women thing. The good news is that they were not disrespectful at all – just didn’t pay as much attention! You know I love your recaps and this was not long enough haha!!! Sounds like you guys had an absolute blast- and before the FIFA fever hit! 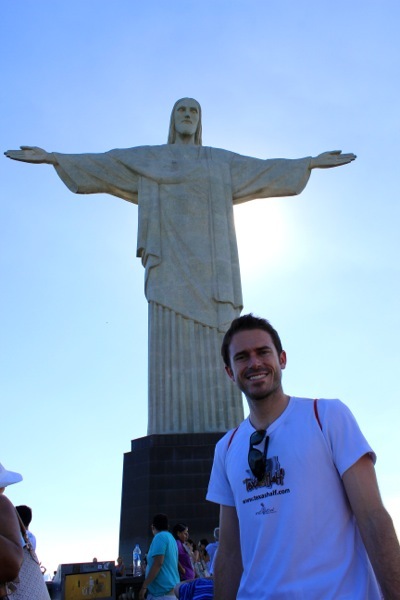 My dream is to go to that Jesus Statue! You’re too nice, Arman! Yes – we saw several signs for the World Cup, but nothing too crazy. Glad your friends noticed the chauvinistic thing as well and that I’m not crazy! 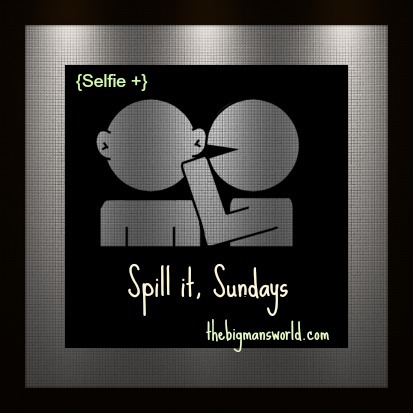 Appreciate you reading the Australia blog AND this one! Thanks for sharing the great recap – though I think you should remove the caveat at the beginning. Because with #4 you reinforce one of the core principles of the blog. You are never didactic or preachy, but rather promote everyone to do and be their best. So on vacation you remind people to enjoy, but keep their ‘health brain’ engaged. Which is great advice. Thank you for the nice words, Michael! You verbalized it perfectly – enjoy, but keep your ‘health brain’ engaged. Love it! And thanks for the compliments on our pictures – we really do have a great time together! !